On dry land, most organisms are confined to the surface, or at most to altitudes of a hundred meters - the height of the tallest trees. In the oceans, though, living space has both vertical and horizontal dimensions: with an average depth of 3,800 meters, the oceans offer 99 percent of the space on Earth where life can develop. And the deep sea, which has been immersed in total darkness since the dawn of time, occupies 85 percent of ocean space, forming the planet's largest habitat. Yet, these depths abound with mystery. The deep sea is mostly uncharted - only about 5 percent of the seafloor has been mapped with any reasonable degree of detail - and we know very little about the creatures that call it home. Current estimates about the number of species yet to be found vary between ten and thirty million. The deep sea no longer has anything to prove; it is without doubt Earth's largest reservoir of life. Combining the latest scientific discoveries with astonishing color imagery, "The Deep" takes readers on a voyage into the darkest realms of the ocean. 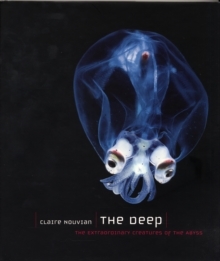 Revealing nature's oddest and most mesmerizing creatures in crystalline detail, "The Deep" features more than two hundred color photographs of terrifying sea monsters, living fossils, and ethereal bioluminescent creatures, some photographed here for the very first time. Accompanying these breathtaking photographs are contributions from some of the world's most respected researchers that examine the biology of deep-sea organisms, the ecology of deep-sea habitats, and the history of deep-sea exploration. An unforgettable visual and scientific tour of the teeming abyss, "The Deep" celebrates the incredible diversity of life on Earth and will captivate anyone intrigued by the unseen - and unimaginable - creatures of the deep sea.